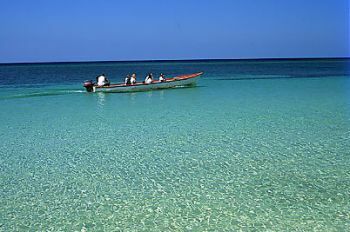 When you're not diving and snorkeling, you can get right into the Honduran culture and look for these fun things typical of Roatan. Check to see if your visit coincides with one of the Roatan Ladies Luncheons; informal get togethers and always fun. Boat Taxis are a Common Way to Get Around several communities and from West End to West Bay. 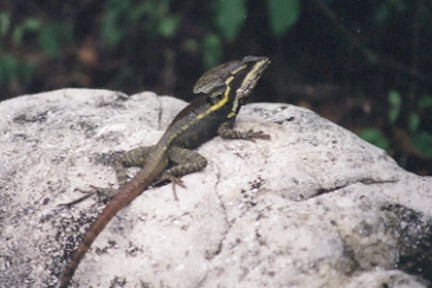 We think the monkey lala (basilisk) is one of the Islands most interesting dwellers. You can see them running like miniature dragons on two legs with their finlike crests expanded. Monkey lalas are often called "Jesus lizards" because these long-toed relatives of the iguanas can race across a water surface (actually hydroplaning) with their forelegs folded and the long tail lifted as a counterpoise, creating the appearance of walking on water! About 120 species of birds can be seen on Roatan, but only about a third of these are residents that live and breed here. 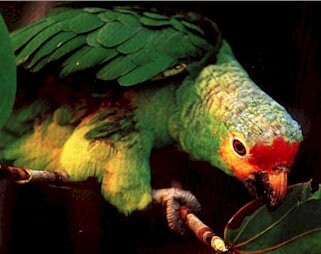 One of the residents, the red-lored parrot, is unique to the Bay Islands. They like to nest in the pines and eat fruits, nuts, and seeds. We see wild parrots most often when the cashews are in season. 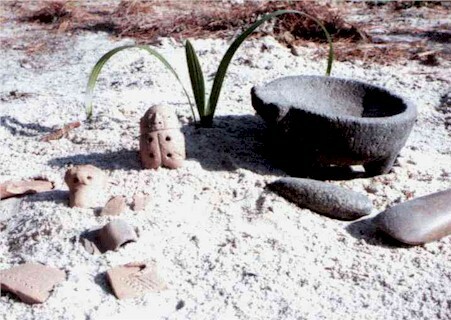 Early residents of the Bay Islands known as the Paya Indians left numerous archeological sites. Among the artifacts are broken pieces of pottery known as "yaba ding dings." Local lore tells that when one of the Indians died, the others would break and bury his pottery with the body. Many pieces have been found and a nice collection is displayed at the Islands museum located at Anthonys Key Resort. "Here are some yaba ding dings found on Roatan in the late 60s: One is a clay whistle. The local children found several of these (all different) overlooking Borden Bite. Scraping stones were also found with many assorted beads. The broken pieces of pottery were abundant on many hilltops. The stone pot was found at a gravesite with beads (including a bronze bead "trade bell") and many other clay artifacts that were not broken. I spent two years on the island in the very early 70s."